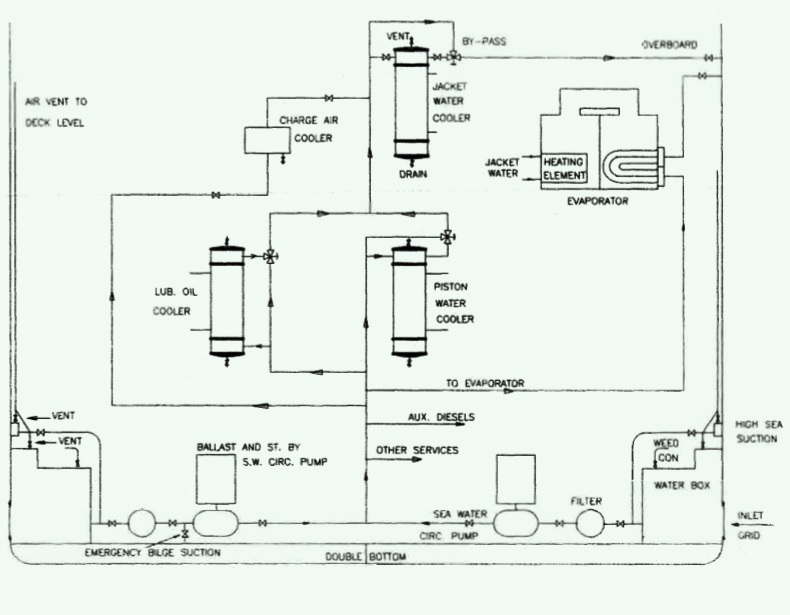 The main sea-water circulating system for a ship with main propulsion by steam turbine is similar to that of a motorship with a central cooling system. The difference is that the sea water passes through a large condenser and an oil cooler rather than central coolers and then to the overboard discharge. The main sea-water inlets, port and starboard, may be arranged as for the motorship example (Figure 1) with high and low suctions, orthodox double entry circulating pump (with emergency bilge suction) and a stand-by pump. Alternatively, the arrangement may be based on a scoop to supply the main condenser. Scoops have been preferred for fast, high-powered steamships, with circulation only through a single large condenser and sufficient speed to ensure that the scoop gives an adequate flow of water. 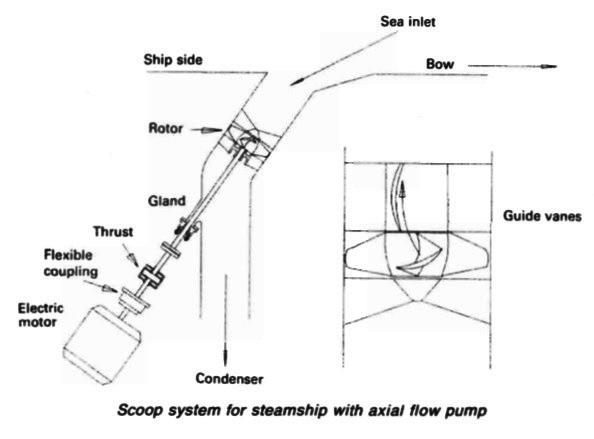 Small axial flow circulating pumps (Figure 2) have been installed in conjunction with some scoop arrangements, with the idea that at speed, the pump impeller would idle and provide very little resistance to the scoop flow. The axial flow pump, intended for slow speed and manoeuvring, suffered from thrust problems when idling in a number of installations.